Spinal fusion is a procedure that promotes the fusing, or growing together, of two or more vertebrae in the spine. Straighten a spine deformed by scoliosis, neuromuscular disease, cerebral palsy, or other disorder. Support a spine weakened by infection or tumor. Reduce or prevent pain from pinched or injured nerves. Compensate for injured vertebrae or disks. The goal of spinal fusion is to unite two or more vertebrae to prevent them from moving independently of each other. This may be done to improve posture, increase ability to ventilate the lungs, prevent pain, or treat spinal instability and reduce the risk of nerve damage. According to the American Academy of Orthopaedic Surgeons, approximately a quarter-million spinal fusions are performed each year, half on the upper and half on the lower spine. The spine is a series of individual bones called vertebrae, separated by cartilaginous disks. The spine is composed of seven cervical (neck) vertebrae, 12 thoracic (chest) vertebrae, five lumbar (lower back) vertebrae, and the fused vertebrae in the sacrum and coccyx that help to form the hip region. While the shapes of individual vertebrae differ among these regions, each is essentially a short hollow tube containing the bundle of nerves known as the spinal cord. Individual nerves, such as those carrying messages to the arms or legs, enter and exit the spinal cord through gaps between vertebrae. The spinal disks act as shock absorbers, cushioning the spine, and preventing individual bones from contacting each other. Disks also help to hold the vertebrae together. The weight of the upper body is transferred through the spine to the hips and the legs. The spine is held upright through the work of the back muscles, which are attached to the vertebrae. While the normal spine has no side-to-side curve, it does have a series of front-to-back curves, giving it a gentle "S" shape. The spine curves in at the lumbar region, back out at the thoracic region, and back in at the cervical region. Abnormal side-to-side curvature of the spine is termed scoliosis. An excessive lumbar curve is termed lordosis, and an excessive thoracic curve is kyphosis. "Idiopathic" scoliosis is the most common form of scoliosis; it has no known cause. Scoliosis and other curves can be caused by neuromuscular disease, including Duchenne muscular dystrophy. Progressive and perhaps uneven weakening of the spinal muscles leads to gradual inability to support the spine in an upright position. The weight of the upper body then begins to collapse the spine, inducing a curve. In addition to pain and disfigurement, severe scoliosis prevents adequate movement of air into and out of the lungs. Scoliosis also occurs in cerebral palsy, due to excess and imbalanced muscle activity pulling on the spine unevenly. Idiopathic scoliosis, which occurs most often in adolescent girls, is usually managed with a brace that wraps the abdomen and chest, allowing the spine to develop straight. Spinal fusion is indicated in patients whose curves are more severe or are progressing rapidly. The indication for surgery in cerebral palsy is similar to that for idiopathic scoliosis. Spinal fusion in Duchenne muscular dystrophy is usually indicated earlier than in otherwise healthy adolescents. This is because these patients lose ventilatory function rapidly through adolescence, making the surgery more dangerous as time passes. Surgery should occur before excess ventilatory function is lost. As people age, their disks become less supple and more prone to damage. A herniated disk is one that has developed a bulge. The bulge can press against nerves located in the spinal cord or exiting from it, causing pain. Disks can also degenerate, losing mass and thickness, allowing vertebrae to contact each other. This can pinch nerves and cause pain. Disk-related pain is very common in the neck, which is subject to constant twisting forces, and the lower back, which experiences large compressive forces. In these cases, spinal fusion is employed to prevent the nerves from being damaged. The offending disk is removed at the same time. A fractured vertebra may also be treated with fusion to prevent it from causing future problems. Sometimes, spinal fusion is used to treat back pain even when the anatomical source of the problem cannot be located. This is usually viewed as a last resort for intractable and disabling pain. 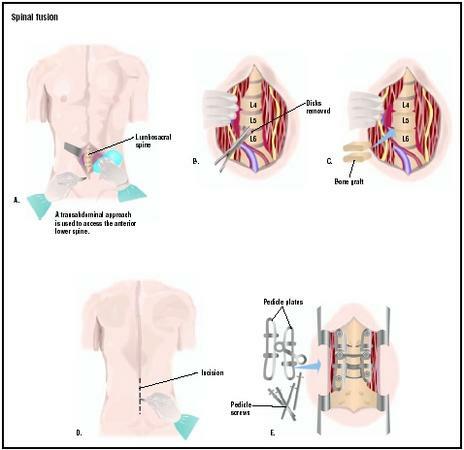 Spinal fusion is performed under general anesthesia. During the procedure, the target vertebrae are exposed. Protective tissue layers next to the bone are removed, and small chips of bone are placed next to the vertebrae. These bone chips can either be from the patient's hip or from a bone bank. The chips increase the rate of fusion. Using bone from the patient's hip (an autograft) is more successful than banked bone (an allograft), but it increases the stresses of surgery and loss of blood. Fusion of the lumbar and thoracic vertebrae is done by approaching from the rear, with the patient lying face down. Cervical fusion is typically performed from the front, with the patient lying on his or her back. Many spinal fusion patients also receive spinal instrumentation . During the fusion operation, a set of rods, wires, or screws will be attached to the spine. This instrumentation allows the spine to be held in place while the bones fuse. The alternative is an external brace applied after the operation. An experimental treatment, called human recombinant bone morphogenetic protein-2, has shown promise for its ability to accelerate fusion rates without bone chips and instrumentation. This technique is only available through clinical trials at a few medical centers. Spinal fusion surgery takes approximately four hours. The patient is intubated (tube placed in the trachea), and has an IV line and Foley (urinary) catheter in place. At the end of the operation, a drain is placed in the incision site to help withdraw fluids over the next several days. The fusion process is gradual and may not be completed for months after the operation. A potential candidate for spinal fusion undergoes a long series of medical tests. In patients with scoliosis, x rays are taken over many months or years to track progress of the curve. Patients with disk herniation or degeneration may receive x rays, MRI studies, or other tests to determine the location and extent of injury. Patients in good health may donate several units of their own blood in preparation for surgery. This may be done between six weeks and one week prior to the operation. The patient will probably be advised to take iron supplements to help replace lost iron in the donated blood. Sunburn or sores on the back should be avoided prior to surgery because they increase the risk of infection. A variety of medical tests will be done shortly before surgery to ensure that the patient is in good health and prepared for the rigors of surgery. Blood and urine tests, x rays, and possibly photographs documenting the curvature will be done. An electroencephalogram (EEG) may be performed to test nerve function along the spine. The patient will be admitted to the hospital the evening before surgery. No food is allowed after midnight, in order to clear the gastrointestinal tract, which will be immobilized by anesthesia. The patient will stay in the hospital for four to six days after the operation. Post-operative pain is managed by intravenous pain medication. Many centers use patient-controlled analgesia (PCA) pumps, which allow patients to control the timing of pain medication. For several days after the operation, the patient is unable to eat or drink because of the lasting effects of the anesthesia on the bowels. Fluids and nutrition are delivered via the IV line. The nurse helps the patient sit up several times per day, and assists with other needs as well. Physical therapy begins several days after the operation. Most activities are restricted for several weeks. Strenuous activities such as bike riding or running are usually resumed after six to eight months. The surgical incision should be protected from sunburn for approximately one year to promote healing of the scar. Spinal fusion carries a risk of nerve damage. Rarely, delayed paralysis can occur, probably from loss of oxygen to the spine during surgery. Infection may occur. Bone from the bone bank carries a small risk of infection with transmissible diseases from the bone donor. Anesthesia also poses risks. Unsuccessful fusion (pseudoarthrosis) may occur, leaving the patient with the same problem after the operation. Spinal fusion for scoliosis is usually very successful in partially or completely correcting the deformity. Spinal fusion for pain is less uniformly successful because the cause of the pain cannot always be completely identified. Unsuccessful fusion may occur in 5–25% of patients. Neurologic injury occurs in less than 1–5% of patients. Infection occurs in 1–8%. Death occurs in less than 1% of patients. Bracing and "watchful waiting" is the alternative to scoliosis surgery. Disk surgery without fusion is possible for some patients. Strengthening exercises and physical therapy may help some back pain patients avoid back surgery. See also Bone grafting ; Disk removal . Neuwirth, M.D., Michael. The Scoliosis Sourcebook. New York: McGraw-Hill, 2001. National Scoliosis Foundation. (800) NSF-MYBACK (673-6922). http://www.scoliosis.org . Spinal fusion is performed by an orthopedic surgeon or neurosurgeon in a hospital setting. How long will hospitalization be necessary? Will patient-controlled analgesia (PCA) be used for pain? How soon can the normal regime of school or work be resumed? I had a fusion, disc removed and nerve root area enlarged. No blood was taken before surgery. During surgery I lost alot of blood and became anemic. I was in the hospital for 19 days. It has been seven months and I am still having pain. My legs hurt, my shoulders or arms hurt. They go back and forth. Sometimes when I sneeze my legs will go out on me. I had an MRI done recently and it showed that two of my disc's were bulged. My doctor says I could have nerve damage. will my pain get any better. Should I get the two other bulged disc's taken out. Please help. Can you give me information on the use of bone morhgenetic protein for spinal fusion? Has the FDA approved its use? i has been operated in L1 5 months ago, derived from a car-pedestrian crash, my intrumentation whas two 15" rods and 8 screws, i dont feel pain other than muscular one and the sacro-illiacus articulation, i think mental attitude is the principal way to recovery. If there is anyway you can modify your life to survive without fusion do it . If there is anyway you can do that without taking the new time release morphine pain killers ..do it . This site is the most honest one I have found about what can happen . You can always do a fusion later but can never undo one . Dont believe you cant get addicted to painkillers if your in pain thats bs and the drugs kill plus take away quality of life for many . Again there are exceptions to the above but for most you will think I will be ok ...well you better plan for the worst. If your single with nobody willing to care for you for life and will not take your life or die without risking either alternatives dont do it . Modify your life and live accordingly . Start making friends that are disabled and discuss issues about living with this long term . How do I loose wieght after my surgery? I had a spinal fusion with intrumentation 13 months ago. My weight gain is in my middle area (waist line). I am actually slender other that mid-section. Please advise me if you can. The surgery was very sucessful. a article about Oklahoma Spine Hospital in Oklahoma City, Ok. I want to scream. I'm a veteran from Desert Storm and always helped other people, live in Utah hope to go to OK soon Cheryl. I'v had two back surgery's in the past 3 years. Starting at the ripe old age of 19yrs old. The first, to fix a herneated disk at L4/5. It was the most pain i'v ever been in, in my life. My pain got better about 2 months in. But about 6 months in my pain took a drastic turn for the worst. I felt worse then before my surgery. They said that i developed spinal bursidice(sorry, not the best speller) due to the instermintation that was in my spine. So 1 and 1/2 years after my 1st sergery i prepared to go back in for spinal instermintation removal. Hoping that my sorce of pain was from the foreign material that was in my body i proceded. I again felt better almost imediatly after. But atleast this surgery was 10 times easier than the last. but like last time i started to go down hill fast. i did everthing i should have done(a.e therapie, bed rest, no working). i was stunned. i thought my body would bounce back quickly. but it did'nt. exactly opposite actually. I was worse then i had ever been. I now spend my days on the layzboy watching t.v. for hours on end. i can't work or finish college. I can't even walk around for more than 10 min. w/out extreme discomfort. I have no social life whatsoever. My doctor said that my fusion was unsuccessful and that he wanted to repeat it again. He also thinks that due to the fusion, i have now become unstable again. He thinks that a repeat fusion w/ L4 L5 S1 stabalization will give me my life back. understandably i am extreamly resistant. I don't want to live my life in extream pain the way i am now. I also don't want my life to revolve around painkillers and my back brace that by the way, i ware 24 hrs a day; 7 days a week. CAN ANYONE HELP ME PLEASE! I HAVE NOWHERE ELSE TO TURN. THIS HAS TAKEN OVER MY LIFE COMPLEATLY!!! and i fear i will lose my life for ever if i don't find relief somwhere. does anyone have any advice for me? i would be so greatful. I had a spinal fusion on my lowest disk 17 months ago I have gained 45lbs in the mid area. I try to exercise and walk the best I can but end up getting sore and have had no improvement. I have been exercising and walking on a regular basis for the last 4 months with no improvement. After my surgery the outside of my left leg in the calf area was numb and still is even though my surgion told me it would go away in a couple of weeks. I am just wondering if there are any exercises I can do that won't make me feel worse, and if there is any advice on my leg numbness. My son is 14 years old has a curvature of 80 degrees does have severe cp and is extremely delayed, but besides that very healthy have never had any complication except, seizues and operation for hips , last year we did some tendon release supposedly it would help out with his back at that poin the curvature was 34, but know they told me we need to have back surgery, I know this is probably the best but do not see if its worth my son going thru this surgery in his state, If he would were a brace coulndt I prevent it from getting worse? I was in an auto accident and burst a disc L2/L3 and cracked/chipped the bone - as a result I had L1-L5 fused with 2bars and 8 screws and some sort of a compound that promoted the fusion. It has been one year and the bones are completely healed. I spoke to the Dr about taking out the metal which he approved of and also asked about any possible way of removing the "fusion" from L1 and also from the L5 since those weren't damaged and in reality no longer needed to be fused - He said no, but with today's technology and the skill levels of Dr's today I can't comprehend why it wouldn't be possible - so if L2/L3 are now one and all of the others were never injured it would only make sense that a person would want them to be undone or go back to normal - and my other question is if L2/L3 were injured and Metal rods and screws were installed to hold L1-L5 in place so L2/L3 could heal why put the fusing compound on everywhere? Why not leave L1 and L5 unfused and just attached the hardware to it with the intent to remove once the fusion of L2/L3 is complete. Anyone know of any doctors to speak to about undoing L5/L4 and L1? I also heard that I could have had the option of just wearing a back brace for 3 months while the L2/L3 disk and bone healed instead of the total fusion - any thoughts? during surgery in terms of units?? i had spinal surgery one year ago i am in a wheel chair as i am unable to stand or walk for more than afew minutes without severe pain i am 70 years old and have also suffered heart failure before my spinal op.sitting in the chair i have none or little pain my legs from the hips down are fine and kept exercised by propelling my wheelchair my feet.from the waist up iam also very fit my only problem is the area of operation. q.is there any specalist therapy i should seek. should i push myself and bear the pain for days aferwards. could he has one process to make his spine straight without needing to surgery every (6_8) months? please found attached the reports and x_ray photos . i had a spinal fusion done 1*19*2010. L4, L5 and S1. it was the worse pain the human mind can imagine. 10 months later im still in severe pain, can't sleep at night, live on very strong pain killers...basically no life. my last scan showed i have one of my screws backing out. how can this be fixed? my right hip hurts a lot and still have numbness in my right leg along with LOTS of lower back pain. will it ever get better? I had a T12-L4 spinal fusion & laminectomy on July 6, 2009. I am only 29 years old & still to this day have severe pain, numbness in my spine. I have handled this pain for over a year & now im going back to see the Dr. tomorrow. Im wondering if something has gone wrong or if I possibly have arthritis in my spine. I cant sleep at night & im tired of hurting every single day. Anyone have any suggestions? I had spinal fusion over 2 years ago from T3-L2 when I was 15 at a 52 degree curve. I have been in constant and more pain ever since the surgery. I recently just found out I also have a broken screw. No one can figure out why I am still in pain. This has really affected my life and especially social life. Does anyone know a good dr. to go to? Read This! It is interesting. Just want to send this to myself. is this enough. my son has duchenne he is 21. in 2004 he had spinal fusion in 2009 he developed adeep infection where they removed partial intruments it is now 16 months later and he has 4 open draining wounds along his spine. he did a course of iv antibiotic and has been on maintanance bactrium for the last 12 months. are there any options other than removing the implants, which they think survival rate is low due to status of his duchenne. he continues to develope these open wounds how many are to many and what is his risk of dying from the infection. I am reaching out to you in hopes that someone out there may have gone through a spinal fusion then had the hardware taken out to help the pain from after the fusion. My fusion was done in November 2007 to correct Kyphosis. I now have two rods, 23 screws, and two hooks from under my shoulder blades pretty much throughout my entire spine. The pain since surgery is much better than the pain I had before surgery. However, I still have a lot of pain. My surgeon basically told me that he thinks the option to help would be to have the hardware removed. They are trying to pinpoint the pain areas and it's all pointing to the hardware. I've tried physical therapy, exercise, etc., and it doesn't seem to make a difference. I am 32 and the surgery was done long enough ago that the doctor said that having the hardware taken out won't affect anything and that it's been long enough where the spine should be fused (therefore making the hardware useless at this point). I am just afraid of my spine curve coming back down the road. I am also afraid that taking out the hardware will be like having the surgery all over again. Any advice? THANK YOU! My husband had a fusion of L1,2 & 3 nine yrs ago. He occasionally suffers a "spasm" which can last days and cannot sit properly. He takes Robaxin to relax the muscle which does not help. He says it feels like his back wants to "click" and then all will be ok. I am worried it could be more serious than that. what could possibly be wrong? I had this surgery in 2008, I was exercising the other day and my husband noticed a large bruise on my lower back were I had the surgery. Why did I bruise? Could I be bleeding internally from the movement of exercise? I too had fusion and stabilisation surgery (L3-S1) in April 2008 and then additional surgery in Nov 2009. I have been increasing my physical therapy and have started to develop bruising around the surgical site. I too wondered about internal bleeding but am thinking it's more likely that I'm moving more so maybe stretching areas that haven't been exercised for a while. Be interested to hear if you have a follow up on this? I am a 33 year old femals who was fused for a 48 degree curve at age 20. The hardware began to poke thru the skin and I was constantly in pain. Doc said hardware was useless once the fusion was solid and since i had been fused for 14 years, we decided to removal all the hardware from T2-L1. Today is 46 days post op, and at last doctors visit, we compared x rays from 3 week ago with the current one, and my spine fusion DID NOT HOLD. I have already curved 15 degrees in 3 week, and now a 5 degree curve from kyphosis. Just my story. The recovery in my opinion was much worse to have the hardware removed due to the extensive muscle cutting and truama to all the soft tissus. None of this is fun! Nor does it allow for a normal life. I scream and cry everyday, still. Now the doc want to re-fuse the spine and add all new hardware. I am going to wait to at least heal from the removal surgery before they put me thru all this again! I pray for us all with back problems. I would also like to add that the website says the fusion surgery for scoliosis takes 4 hours, this is not accurate! Mine took over 11 hours, which most fusion with hardware cases take. It says you will spend a week in the hospital, try 14 days! This website doesnt even begin to touch on the reality of the surgery. It is not for the weak. It will be the hardest thing of your life! You loose the ability to bend, twist, well every activity is limited, for life! Again, I am fused from T2-L1 which is about as much fusion and hardware possible. I wish you all the best of luck and can be emailed with questions or concerns at surfergirlatx@yahoo.com, if anyone would like to know the REAL story of scoliosis spinal fusion with instrumentation. It was discovered at age 11, and I wore the brace, I did everything under the sun to avoid surgery, but the scoliosis curving spine is really hard to stop even with proper hardware. And the pain will last a lifetime, eithr with or without rods. Please dont take any of my posts as negative, they are just real first hand encounters. I feel alot of the scoliosis docs are more concerned with getting paid rather than proper patient care. I have been dealing with this for more than half my life and I have constantly done my research, I just wish the doctors cared as much as we, the patients do! My brother had an accident recently(seven months) and our worries till now were his traumatic brain injuries and how would he will recover completely from them, but a week ago a doctor discovered a new issue, his vertebrae, and more specific that his seventh thoracic vertebrae was broken and caused a curve on his spine and they told us the best way(didn't specify if there is another) is to do a spinal fusion till that moment i didn't knew what that was so my question is: Is there any other way to solve my brother's problem ? I had injuried my back in 2006 and I broke 4 vertebrals. Two in my neck and two in my back. They did operate on T-9 AND T-10 . What happen was that on one of my vertabrals they did a vertaplasy and on the other one they were only able to take out the pieces. So here is my question are they able to stop all of the pain that I'm dealing with. Right now I have to take 4 different types of pain medications a total of about 12 pills everyday now. Oh also do to operating on my back they did something to cause me to have pain in my legs also . If there is a operation that will take away the pain and give me back my life what will it cost? And can it be done on Medicare? Can someone please tell me the cost for spinal fusion hardware removal of L4,L5, and S1. I have no insurance! I had a spinal fusion (L5S1) two years ago and my pain got MUCH worse after that. I cant sit for a long period of time that gives me terrible back, coxcys and joint pain. I am 30 years old and I have pain 24hrs a day. This is really afecting my personal and Professional life. I have seen lots of doctors but half say I need another surgery and the other alf say I dont. What shoul I do? My husband has already had a back fusion at L4-5, L5-S1 in 2005. Over time he is having further pain and severe discomfort. He is now scheduled to have another back surgery extending the fusion to L3-4. We have be unable to locate any pictures of the procedure and would like to know how optimistic we should be on reducing the severe pain he is in. What is the success rate? What should we expect? Please advise. I had my spine fused from t 2 to t 8 . T6 was all most gone ,t 3 and t 4 were so bad to t 5 and t 7 all so were broken I sat up and walk with in5 days left hospital with 10 days . I had surgery on my back in 97 to remove the L4&5 disk. I had a double fusion then on 1999 I had the rods and screws removed that were causing increased pain and then on 9/11/01 I had the S1 removed. Ever since I have been in so much pain but the S1 feels like my tailbone is hurting, can you tell me why this will not get better or go away? This is the information on the surgery I will be having. My only concern is the bone needed. It says that they can use a bone from a cadaver. Any thoughts??? I have severe pain a long the waist region and internal body heart more severe on my two feet these happen some time in 1996 during my active days in sport [judo] could it be spinal fusion? I'm scheduled for spinal fusion from L10 to the sacrum, due to progressive scoliosis and degenerative disc disease and spondylolisthesis. Just wondering if there's anyone else out there who has had the same procedure and what their outcome was. Thanks. I had a spinal fusion with instrumentation 11 years ago L4-L5. It was a nightmare the worst pain I had ever experienced was after this operation. Before the operation I had a herniated disc and a "slipped disc" and I could not walk or stand without sever pain it was bone on bone. However with excellant PT after I got out of that horrible brace I was pain free for quite awhile. Now 11 years later I have some issues at S1 a bulging disc is hitting a nerve and I am back on pain killers. I know that once you screw around with the dynamics of the spine eventually something else is going to happen. Your surgeon is never going to tell you this so know it going in and you will not be surprised. I am 21 years old now. My first spinal fusion was in FEB. 2006, 2ND ONE DUE TO NON FUSION-DECEMBER 2007, 3RD ONE: APRIL 2009. I am doing ok. Struggle daily. ALL of my surgeries were 8 HOURS LONG, 7 DAYS in hospital every time, I was never sick and throwing up. Trouble going to the bathroom. i had a spinal fusion done in 2010 my whole life was ruined iwas in the hospital for over a week my leg became numb the first time the physical therapist got me up to walk it was in my right leg. my back hurts all the time i am on several different pain killers and know my surgeon has suggested to take out the instrumentation. but i had Kyphosis before the surgery and i am afraid that it will return. my life now is based on my back i cant bend twist do anything a normal person would do.my life has change so much i used to be a cheerleader and run track and now i can't even walk straight i limp when i walk because i cant feel my right leg. So i feel with all u people you had aspinal fusion done. I had disk surgery on two disk in C-Spine at first seemed to help my arm pain was gone but still some numbness. My shoulder and upper back pain never left. I wore a hard brace for six months and now that I have it off all the time it is so much worse. My surgeon has me back in Phsical Therapy for about the 6 time since my fall. My hand is going so numb I can hardly type and my neck gets very sore if I sit or try to do housework. It has now been 8 nonths am I ever going to get better? My thumb now seems to move all night which is making it worse any idea why? May be a little late for many of you. you should really consider Spinal Decompression ~ before having Fusions. We have a drx9000 in our office and we get a ton of patients who have already had fusions we can not help them after that point, other than chiropractic care! I have seen so many amazing things happen everyday. hello everyone, I had an T12-L2 spinal fusion due to a severe fracture due to a car accident. All I can say is that the lord got me through it all. I had two broken legs as well so I had to be in a wheel chair and so on recovery is still going on 6 months later. Praying and keeping your faith has to do alot with how well you carry the situation. My prayer goes out to all of you and there is no greater help than the lord himself. Keep him with you at all times and he will not turn you down. god bless everyone. I had spinal fusion due to herniated disc and spinal stenosis. I had pain, numbness, tingling, you name it..in my right side. Now its about 3 months after surgery and having a little hip pain in left side. should i be concerned? I had my first spinal fusion of the L-5, S1 in 1998. Then in 2001 I had to have a refusion and hardware removed in the same area. Two years later I had to have the L-4, L-5 fused because of slippage of the vertebraes. I have spinal stenosis and now I feel like my lower vertebraes are being compressed down whenver I sit or stand. The one thing that seems to help a little is to lean forward and stretch, but the pain is pretty severe. I've been under the care of a pain specialistd since 1998 and take 5 different meds for pain. also I get 8 to 10 shots in my lower back every 8 to 10 weeks,which was helping greatly until about 4 or 5 months ago. Mt husband had a triple bypass surgery and I ended up liftinh him for 2 months whuch hasn't helped my back at all. he weighs 200 lbs and I want to know if that could have reinjured my L-5,S1 area? I have moderate structural scoliosis. I have an S curve and my spine is also twisted. Due to a herniated disc and spinal stenosis I had a laminectomy at L5 S1 Sept/08. In Dec/08 same disc ruptured so I had an L5 S1 fusion on Feb/09. Then I had a right SI Joint fusion Sept/09 that failed. Bone did not fuse. I had the new iFuse SI Joint surgery Sept/10. Other than the raging pain down my left leg from original herniated disc I am in more pain now than before my 4 surgeries. I am in bed 50 percent of the day. There are many periods of time where I try to stay out of bed and work through the pain by building muscle but that just makes the pain worse. I am 56 years old and feel my life is over as there are so many things I can no longer do. I have been back to my spine doctor several times but there is nothing more he can do. He is a scoliosis spine specialist neurosurgeon and while I have complete faith in him, I also feel that perhaps having 1 fusion is putting too much pressure on my other discs causing the pain. Pain is also still in my SI Joint area but now that I have a fusion I can no longer get cortisone injections in that area. If anyone has any suggestions, please comment. My lower back is very bad. I have been through Chiropractic, Traction Physical therapy and have already had one discogram. I dont walk very well cant do stairs and sometimes afraid to move. I am a sales person and am in a vehicle alot. I have had tests in the hospital to know if its muscular or disc related and mine is all disc related on l4 and L5 I dont read many sucess to spinal fusion and am scared to death. Is the reason I dont hear about sucess that people just dont respond. My wife had aspine fusion in 1970/80. We have always understood that she would not be able to have an MRI scan because of the screws in her back . She is currently having trouble with her left leg and the GP suspects A prolapsed disc and the Consultant is arranging for an MRI scan.I am trying to discover what materials were used in the 70/80s to make the screws and thus anMRI scan would be safe. Worsened pain after surgery?? It may be Arachnoiditis!! I am a sufferer myself. Look it up. Since many times it is caused by medical procedures, doctors are hesitant to diagnose!! Many times just labeled "failed back surgery syndrome". It's terrible, and becoming an epidemic. Don't let anyone tell you the pain is all in your head! I had a spine fusion on May 4th,2011.This was a result of degenerative disc disease.My back is worse now.I have arthritis.My dr.also told me that I might have an infection next to the metal cage in my back.If I hav the infection,how did I get it and what are the risks/outcome?What can I do for this and the arthritis?I am going to try more injections. The pain is very dehabilitating.I could use your advice besides some stretching et. I had fusion of L5/S1 in '99, fusion of L4/L5 in '01, both successful in eliminating pain and allowing life to proceed. In 2010 i had revision fusion to reinforce the never quite fully fused fusions, again it worked successfully. Now 2012 and i'm scheduling fusion to have remainder of lumbar fused with instrumentation. It is a relief to be getting the rest of the lumbar fused am willing to go through the post-op pain to get to a point in life that will need no pain meds and hope of going thru life without pain. Having had very successful fusions i am very fortunate to have had success. I'd spent three years on disability with agonizing pain after two failed laminectomies, by doctors who could only be described as hacks who barely get thru the day without crippling someone. I was injured at work in 1994. I had a hemi laminectomy right and discectomy at L5-S1. About every few years I had severe pain and lost several months of work. In January 2012, I had unbelievable pain in my hips and right leg to my knee and hamstring. I also experienced groin pain. I was also numb at my right knee and the inside area of my right leg no lower than my knee. I had an MRI which showed four discs above my past surgery herniated and scar tissue at the site of the original surgery growing on the nerve. I was unable to walk at all or sleep. I went to a spinal surgeon on a Friday and had a discectomy and spinal fusion on the next Monday. The fusion is at L3-4.I have a few questions that I am curious about. My surgeon told me that doing a bone implant is old school and he uses a cement like substance where the disc was removed. I researched this and couldn't find any information about this. The numbness in my knee and leg is still there six weeks after surgery. The doctor told me that it will take about two months for the nerve to regenerate and it should go away. I'm skeptical about this and have heard stories that it may never stop being numb. Can anyone provide some insight concerning my questions. Aside from the numbness, I still have the grion pain which on occassion feels like a hernia ( had left and right ilioinguinal hernia sugery) in 2005.Other than that, I can walk and have no other pain which I feel lucky about. Hi, i have a Spinal Fusion in 1968 at the age of 14yrs where they use bones chips off of my hip. I'm have Idiopathic Scoliosis. I'm now 59 years old and my spine is curving again this time I'm in pain all the time, and I'm leaning to the left and it is noticable, I hate it. I just need to know what can I do, is there any other way beside surgery that can correct my problem. It sounds like you are fanicg a very difficult decision. I can imagine how you must be feeling. Once I was in a car accident and was unable to drive myself anywhere for about 6 months, because of the injuries and then because I had no vehicle. Once I got back my ability to drive, even then it was scary because I was so nervous that I would get hurt again. That was just with injuries that healed, not something as serious as what you are experiencing. Theoretically, I agree with the first commenter. It seems better to live happily while you can than to be miserable. Independence is beyond value, and without it we all feel paralyzed in some way. In your case though, there is a clear danger involved. I know the streets in India are quite different than what we are used to in the US. Is there any possibility of a different kind of vehicle? Or maybe some kind of back brace that would decrease the impact to your spine should you fall or collide? I'm not sure there is a correct answer for you. Whatever you decide to do, it is your decision and you have the freedom to make it. I hope you are able to overcome your depression and live happily, regardless of which choice you make. I have had 5 spinal fusions (3 cervical in 08 & 2 lumbar in 09) and have gradually increased my physical activity to the stage that I'm now training for a marathon to be held on my birthday this July--the day I begin my 70th year of life. So there is hope! Our lab works on technology that allows, among other things, to reduce Ti spinal rod diameter by 0.5 to 1 mm. There are some benefits on personal and industrial levels. My request pertains to industrial level: could somebody suggest how I can get an estimate on savings in material? I broke my back about six months ago. I fell 5 metres and landed on my but. This compacted my spine. I shattered the L2 and Fractured the L3. I had to have an operation which took the shattered bone out and put two titanium plated, a cage and six screws into my back. I was wondering if anyone knows how long the bone graft takes to grow enough to stabalise the back? I suppose everyone is different but about how long? And how long is it before the pain settles down. Picking up things is horrible and putting shoes on is hard and painful. Anyone help?? My wife had a fusion on L5S1 in 1995, NO support rods or screws or any other materials other than bone mush were used. Since that date she has had her life ruined. Anyone had a similar experience? PROBLEM I HAVE IS PAIN IN THE LEFT LEG WHEN STANDING. ANY ADVICE. THANK YOU.RUBY SOUWITZSKY. Hello i had a Scoliosis Kyphosis Thoracic Lumber Fusion T-1 to L-5 in Johannesburg in 1977 Performed by a Leornard Nainkin he was an outstanding Surgeon and did a supurb job on my Spine it was probably the most successful Fusion performed in South Africa but lately i have been experiencing intense pain in the Lumbar region especially when sitting down and standing up again i am walking with a stick now i should be very grateful that i am walking and i am could anybody possibly explain to me why i have this intense pain in the Lumbar region i think the Facet Joints maybe responsible but could it be something else maybe? i spent 2 months in hospital on a Stryker Turning Frame. #72 : Stephen, it sounds like you're experiencing extreme wear & tear at the lower end of your fusion (mine was T5-T9 in 1991 for facet joints, so my problem is much less than yours!). It might be worth getting the fusion extended to S1, but that will only work if it's just a problem with L5/S1. A good radiologist should be able to tell you. Hope this helps! For everyone else reading here : FUSION SHOULD BE THE VERY LAST THING YOU TRY!! I can't stress this enough! I've been extraordinarily lucky with my fusion, but then I had a fantastic neurosurgeon (Prof Graeme Brazenor, Epworth Hospital, Melbourne) and a wonderful pain management team. However, because of the stress fusion places on the joints above and below the fused area, you WILL need to manage your health, and you MUST strike up a good relationship with your surgeon, your doctor, and your radiologist. It's difficult to do this in Australia, but it's possible. Keep aware of your limitations, don't think that the fusion will fix everything, and let your doctor know when you're having trouble with pain. It's far better to have a hundred X-rays or MRIs than to just put up with the pain. Get involved - learn about the spine, learn about pain and pain management, and if you can, get your GP or doctor to recommend a multi-disciplinary team to work with you. You might also like to consider hypnosis, and I'm also working on some other therapies, but because I"m not a doctor, I'm having trouble getting medical specialists on board (old boys syndrome, unfortunately). I'll try posting back here when I have more info. In the meantime, check out my blog - cephasatheos.wordpress.com, and feel free to discuss, comment, and I'll do my best to offer suggestions and advice. Stay positive if you can, and lean on your friends. Im 39 years old..I ham a laminectomy oct 2011 Feb 2011 fusion @l5 s1 Sept 2012...1 month after surgery my hardware migrated out and up my spine into my muscle can anyone tell me if they have experienced this I am in terrible pain and am tired of surgery! pluresey, which is the fluid between your ribs and the lining of your rib cage. Mine is GONE from the lung surgery . So the best way to describe that pain is *wicked*. Does anyone have any advice for me? In 1993 I had an auto accident and ruptured C4-C5 losing most us of my right arm and hand with sevier pain over the right side of my scaplp that circled my right eye. After my fustion with a doner bone to replace the disk I gained a big portion of my strenth back, but still had right side guarding in the neck, shoulder and right shoulder blad region. In 2002 my husband hit me in back of my neck with his fist and the disc below C4-C5 slighty buldged. Now I have learned there is movement in my fusion and I am having problems down both arms and down my spine and into my legs and feet. X-rays where taken of the fusion area and movement is noted and I am due for a MRI of my neck and a bone test of my neck next week. I am concerned. Is this something easly corrected? It has been 15 months since I had L4-L5 Spinal Fusion. I had totod have the surgery as I could no longer walk. I was excited to have a solution. Wrong. It's been a nightmare. I try to stay positive...I have to. I am 50 year old female and this has changed my life as I knew it. what little energy i have i save for work. pain meds, pt, rest, tears, you name it doesnt work. i've had two rounds of joint facade injections and epirdural as recently as last week. i felt alot of relief until today and feel it wearing off already. doc wants to do spinal plug joint facade injection. other doc said absolutely do not do it. im single, afraid, try to hold on to hope and know others are dealing with this and worse. no social life. have no idea if i should do surgery or not. day by day. lots of prayers. prayers for all of you. friends, family uncomfortable when you oontinue to share about your pain and fears. My daughter is eleven an diag w scoliosis w two curves greater than 50 degrees. Doctors recommend spinal fusion. It's a tough choice. She is very active in sports, chearleading, gymnastics,and dance. I worry that after surgery that she won't be able to to those things as well as she does now. They say she won't be able to back bends or be able to twist her body. Ride roller coasters. Do I want to take that away from her. Should I wait.any body have any advise that could help me make a wise decision. I have a T3 incomplete spinal cord injury and I need to know if I can have corrective surgery on this. hi I had discs removed x3 and spinal fusion lower lumbar region in nov 2012. The pain after was agony but it got better and I went back to work in may2013 for 2 days a week. Im a support worker everythink seemed fine till june 21st woke up and my spine was numb and my lower right side as this wore off I was in a lot of pain. I can now feel a heavy sensation on my right side. I have been told this is the metal and the screws and it will fade in time or I have to get used to it. Iwould like to know if anyone else as this problem im due to go and see my consultant in august and have a xray as im still told its early days. Hi My daughter is nearly 17 and due to have surgery in oct they was going to do in sept but I said no because we had not seen her surgeon to talk about her last MRI. I do not understand all the terms that are being used on here I just know that she has a 60% top and 55% lower. But this may be more when we see him this week coming. The surgeon has said he will save the bottom 3 discs does anybody know what this means in terms of T1 - T5 he said just below the bra line I am so confused. college will touch her now. I am worried sick about this as she is a very young 16 year old and I do not think she has a clue about the hole entire thing. Hi sorry I also forgot to say that she has to have rib removal op aswell. as a child and into my mid twenties I was very active and fit, but a trampoline accident when I was 14 gave me pain in my back from time to time. As time progressed the episodes became worse and despite physio for years, the pain became too much and at the age of 34 after an episode where I couldn't walk for 2 weeks (In 2005) I had a fusion on L4/5. the surgery went well but is took 12-18 months of physio to get all of the muscles etc working without pain. I didn't look back after this, but, I have had various problems with my neck which was resolved each time with physiotherapy. I also had continued problems with my lungs and suffered several episodes of pleurisy, pneumonia, chest infections and had a lot of "women's" problems. I ended up having a full hysterectomy in 2012 and recovered quickly. Since then the chest problems have continued and my lung specialist has been struggling to find out why I am so breathless, getting blue lips and infections regularly, along with a persistent cough. After months of investigations and various treatments, it was discovered I had a pulmonary embolism and am still on warfarin to ensure it does not come back. I am unable to continue with HRT and this worries me due to my previous spine problems. A reason for the PE have never been found but my health continues to deteriorate. My weight is rising due to inability to exercise rigorously, I cannot each large amounts of salad/veg whilst on warfarin as it contain vitamin I which is the antidote for warfarin! I was put on rivaroxaban initially but started coughing up blood and had raised blood pressure and headaches and had to be switched to warfarin. After returning to my lung specialist this week, he listened to my lungs and although breathless they were clear, but when he examined my back he noticed a slight curvature and there was a noticeable dip in the thoracic region which you can feel when you run your finger down my spine. Also the muscle to the right of this area has diminished considerably. This is the area around my right lung where I have been getting the constant pain. I am still breathless and have started keeping a diary of my "funny turns" and it would appear they happen when I am active (ironing, walking, housework, working). I have now been referred back to my spinal surgeon as he is worried that it may be spinal determination causing my problems. I have an appointment in two weeks and am very anxious to know the outcome. Hopefully it is not my spine and my symptoms with improve with time as my body heals from the pulmonary embolism. I really want to get active and lose the weight I have gained as this will not be helping me as I have always been slim until my surgery in 2005. Since then my weight has slowly crept up despite various diets!! It is all very frustrating - I am only 42 and want to get on with my usual hectic life as a mother, wife and business women without constant illness!! Has anyone else out there had these type of problems after a spinal fusion - or is it just coincidence? I was fit and healthy before my fusion in 2005. Many of the questions asked should be directed to your surgeon. Write down your questions beforehand. Carry a tape recorder and bring a friend. Many also desperately need to get a second opinion asap.. (My late husband was an orthopedic surgeon and I worked with him for 2 years so I know a little-very little. 9 weeks ago (this is 2014) I fell 8 ft onto the pavement on my back, primary on the left side. Since I was far from my home state at the time I was flown to Cox Hospital in Springfield, MO. I had 15 plus fractures in my back and L1 and L2 were crushed. I had 7 broken ribs, and 1 crushed rib and a punctured lung. I HAVE NOT BEEN ALLOWED TO SEE MY SURGEON FOR A FOLLOW UP because Cox sent me to their high functioning 3 hour per day rehab almost immediately after surgery (5 days post ops). Of course I couldnt do anything but walk a little and sit up in enormous pain. They refused to med-van me to the Dr. because "it was against their liability policy to transport patients anywhere" and he refused to walk across the street to Cox rehab to see me. Because I transferred to another facility a week ago I'm able to go to my surgeon next week. . I have horrible never pain in my left arm and both legs as well as ongoing terrible headaches and dizziness, yet Cox refused to give me an MRI . I'm now able o use my lap top and researching some of your suggestions, but if anyone has had a similar fall and injuries I would appreciate your input as to what might help me. I had fusion of l3 to s1 in 2004, I haven't had too much pain until the other day, I was getting out of bed and something popped in my lower back I am having pain like before I had rods put in, I had an xray done but haven't gotten the results yet I'm just wondering if it could have been one of the rods breaking or something.has anyone else experienced this??? I had my fifth neck fusion six weeks ago. I am fused from C3 to T1. Neck muscles are still sore after removal of my neck brace a few days ago. However, I find I am very tired for several hours each day. I will be 70 in January 2015. Should I be so tired? Is this normal? Been reading all of your Post, I had my l3 l4 l5 l5 l6 and a cage put in, yes it has only been well Dec 3 3 months but let me tell you all, if you have not had surgery DO NOT HAVE IT do not it is not the answer, I wished a 100 times over and over I would have never done this, I am 49 I have had my Grand Daughter since she was born, I had a pretty neat life, I hurt yes pretty bad, but I got through it with of course Strong Pain meds, my Goal was I am getting my Masters in Law, I wanted to teach, I was under the understanding I was going to be 95% better, well hello NOPE it is so horrible one of the worst decisions I have ever made in my life, I do not even look forward to life, I was planning to go into rehab getting off the drugs, well this is what I was told you will never be off medication you will be forever on Narcotics I am so over this, I am so depressed I am now seeing a shrink I am taking dang meds for my Mental Issues that have come from this surgery, I have gained weight I have NO LIFE nothing really to look forward to, I just wish someone like you all could have told me, I wished I would have read this site I would have thought twice. I am so heart broke reading all of your Post I am so sorry for you all. God Bless you all and I really hope as I am you all find something that gives us all some kind of hope. This is so not fair. I currently have a L4-L5 herniated disc. Did anyone try Spinal Decompression before having spinal fusion? It's traction, for separation of vertebrae to decompress disc, to regenerate it. Make the disc reshape itself. Learn about "Lateral Raphe" (L2-L5) in the Thoracolumbar Fascia Lumbar Spine. This is part of your "Internal weight belt". The other part is "Transverse abdominal" which is fascia connection under your 6-pack of muscle. When you pick up weight, Lateral Raphe, starts working to stabilize your core. It tightens & pulls on your lumbar spine(spinous process), squeezing your disc. Overtime our disc wear out and start to bulge. You know what happens after that. ...new Fascia bio-science and Thoracolumbar Fascia based bio-mechanics are being tested to understand causes and bio-mechanics to abolish low back, sciatica symptoms, subluxation, reshape a bulging disc by regeneration of IVD. Google Dr. Robert Schleip, PhD fascia researcher. There seems to be real hope in reducing our LBP, with or w/out failed fusion surgery. I have read/listened to you over the years about your past & present pain. From what I know now. Avoid spine surgery by educating yourself about spinal decompression. Then catch up on Fascia & Thoracolumbar fascia and what it does and learn how to relax & release it!! I would like to know if Lumbar Surgery is recommended. I am 70 years old, I do not experience pain only when I walk a mile or so. I walk everyday because I am diabetic and have a heart problem problem. Need to maintain my weight. Other then that I do not have pain. Any suggestions. I had four level fusion over 14 years ago, and I have been Morphine and Percocet sinse my surgery. I wish I would have known the out come before I had the surgery. Due to the surgery, my left leg has had a cramp. Imagine living 14 years with a "Charlie Horse" in your leg 24/7. My back pain is much worse than before the operation, and now I am being told that due to so many meds for so long, it is now effecting my liver. At last count, they told me I have been on over 139 different types of pain meds. I did not know there were that many to tell the truth. I would Never go through that again, and would only advise having that surgery only if it were a life and death situation. I got operation laminectomy and discectomy of backbone l1, l5 and s1. after 3 months shall o ride 2wheeler r not with the help of brass. why left leg will pain. now two and half months over. is almost like where my stomachs is yuke! Makes it look fat. What can I do about it? I had a spinal fusionL1-L5 two years ago l have a funny feeling on my buttock and my right tights got a funny feeling also getting cramps in my feet. I have been bothered with spine problems since the age of 9. I was told that if science did not catch up with me, I would be in a wheelchair by the age of 30 (I am 66 now). I finally could not take the pain any longer, and had surgery done from the middle of back done to S2. The doctor put in rods, plates, nuts, bolts & screws. This was done in 2012. After less than 6 months, I was still having worse problems than before, the doctor had left his practice, and so I had to find another surgeon who would believe what I was saying, "My nuts, bolts, plates, & screws were loose"! Finally after falling 11 times in one day, my family doctor put in the hospital, and there after 4 days of tests, I was told that what I had been saying was right, but good luck on finding another doctor that would fix the previous surgery. Finally after many, many, months & more pain that I could ever put into words, I found someone to fix my back. I thought that I was on the way to getting much better, but once again, NO LUCK!!! When I went back for my follow up and to have my staples removed, I was told that he could not fix all the loose hardware (as I have come to call it now), but could only fix one!! He was very frank, without any caring on his face, told me to take the pain as long as I could, and then I would need another surgery, only this time, they would have to go from my stomach, and this would be a much more intense surgery. My family doctor told me to go pain mgmt., which I have tried with NO SUCCESS!!! They either want to do nothing but injections (which DO NOT work at all), or they tell me that I need to have this surgery. Where I live, they have become so strict on pain mgmt., that you can hardly get much more than an aspirin, your family doctor no longer can write for pain meds for an extended period of time. I have always been very active, but at this point, I am not sure just how much longer I can handle this pain. Currently, I am not in pain mgmt. as I cannot find one that will help ease my pain. They all agree with me that I am in tremendous pain, no question, it is just that I need to get another surgery. Has anyone else had similar problems with loose hardware that will require much more surgery, little or no pain mgmt.? I need some help, and answers if there any!!! In 10 days I will undergo the following: repair of previous fusions L4 to S1 (procedure to be determined), Spinal decompression from L1, L2, L3, and finally a spinal fusion from T10 to L4. I am worried about pain and recovery. This Will be my 6th spinal operation, a last effort! I think the key is the surgeon. My neck was so bad, I could not hold my head up any longer. My surgeon specializes and operates only on necks and backs. He fused 3 levels with metal hardware and tissue from my hip - C-5, C-6&C-7. It was horrible for the first two weeks after. I couldn't talk, my throat was killing me - he had to move my esophagus out of the way to operate, and my hip hurt from the tissue removed. Gradually, I started feeling better and now it's been a year and a half and I hardly ever have neck pain. I'm considering a back operation now. I can't stand, walk, sit or do anything comfortably, so I look forward to feeling better. Good luck to all you fellow sufferers, I hope you find some relief. I still have Fibromyalgia, and my body is full of arthritis, but one day at a time is all I can do. 61 yr old with minimally invasive L1-L3 and L5-S1 fusion and L1-S1 rod. 3 months out. Forgot to say it was minimally invasive surgery anterior approach with LLIF for fusion, posterior approach for rod placement. 1st surgery on Tuesday, 2nd on Thursday. In hospital for 1 week start with dilaudid, then hydrocodone. Beared a lot of pain bc did not want to be hooked on opiates. Needed unit of blood and low sodium with water restriction, had slight edema through entire body first few days. 3rd month out and driving, expect to start light duty. Have already started working virtually at home. Hope this will be end of my lumbar back surgeries. I had my L5-S1 fusion done 65 days ago. I am so glad I did. It was very painful the first 45 or so days but continues to improve. The pain I had been experiencing in both hips for the last 7 years is gone. I have been back to work for three weeks (light duty) and in PT for three weeks. I believe the PT was a big turning point for me and highly recommend it. All surgery does not turn out poorly and if you need it get it.